Beading Arts: Welcome to Mixed Media Jewelry Month! What do you think of when you hear the term mixed media jewelry? Is it resin that springs immediately to mind, or perhaps it's fibers? What about metal work and wire? And please, there must be a place for beads! Pure and simple, mixed media jewelry includes any style that combines two or more different materials. Not beads and thread...that's cheating! More like beads and wire work. Or polymer clay and metal clay. Or found objects and resin and beads. Etc etc etc. The list goes on, and sometimes that leads to confusion. If we take this very broad definition for mixed media, I think it helps if we clarify exactly which media we're talking about! I saw that I'd been pretty inconsistent about using the term as a label for posts here on Beading Arts, and I thought that maybe dedicating a month to mixed media jewelry might be a good idea. As I scanned through my years and years worth of tutorials, I realized that an awful lot of them could easily be considered mixed media, so by the end of the month, I hope to have a list compiled of tutorials by different categories of media. That way, if you decide you want to try making some polymer clay cabochons to use in your bead embroidery (which may very well contain some found objects as well), you'll be able to quickly and easily find just what you want. Wanna get in on this project? Wanna share some of your own mixed media work or tutorials? Please email me at cyndi @ mazeltovjewelry.com (remove the spaces), and tell me what you've got in mind. 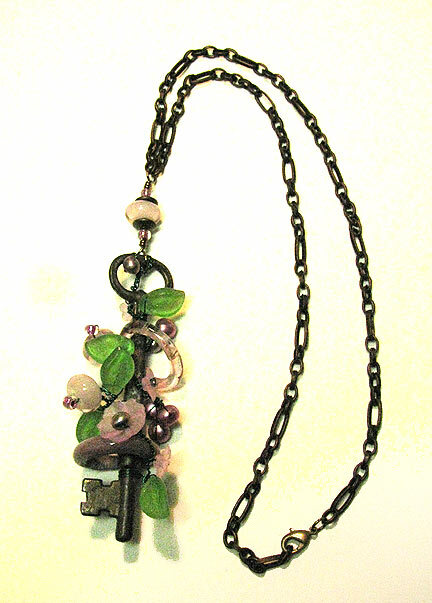 When it comes to mixed media jewelry, we are very very open here. In fact, some of you know that I've got another blog called Mixed Media Artist, so please feel free to contact me also about work you do that isn't jewelry...I love it all!